Vancouver, British Columbia is a perfect example. On Oct. 17, B.C. had just one licensed dispensary, in Kamloops, four hours from Vancouver—Western Canada’s cannabis capital. There are more unlicensed dispensaries than Starbucks in Vancouver. Yet, despite dozens of pending applications, none of them received the licenses they needed to operate legally by Oct. 17. Indeed, the provincial government of B.C. doesn’t even have an exact count of how many unlicensed dispensaries there are. And regulators are moving slow on the application review process to bring them above board. At the same time, there doesn’t seem to be a will to counter the unlicensed market in cannabis— at least in Vancouver. There barely seems to be the will to enforce legalization, to establish a legal retail market that could compete with the well-established network of unlicensed producers and dispensaries. Yet establishing that market, the only way to drive down prices, is the only way to reduce the incentive for unlicensed operators. For now, however, in lieu of a robust and accessible legal retail market, Canadians are going to continue purchasing cannabis from unlicensed sellers. And until provincial governments license more dispensaries, whether private or government-run, there’s only one course of action: enforcement. And that creates challenges for provincial law enforcement agencies. In many cities, policing cannabis is low on the list of priorities. And for good reason: law enforcement actions have been virtually powerless at reducing the footprint of Canada’s unlicensed cannabis market. Unlicensed cannabis producers and retailers realize this, which is why they aren’t backing down. In Toronto, police routinely raid unlicensed dispensaries, shutting them down and seizing products. Yet new shops pop up to replace them. In British Columbia, provincial officials went so far as to deputize unarmed “community safety units” to raid and shut down unlicensed dispensaries. In Vancouver, however, where unlicensed dispensary ownerssay you “have to make an effort to get busted,” police are simply turning a blind eye. Even fines and court injunctions against dispensaries and producers there are proving futile. A recent New York Times report says there are nearly $3 million in unpaid fines for cannabis offenses. Vancouver dispensary operators are simply refusing to pay them. 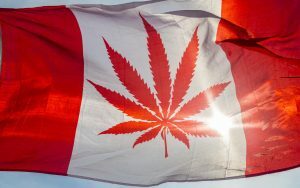 Half-hearted enforcement efforts, the slow pace of licensing, and unmet consumer demand are all keeping Canada’s unlicensed cannabis industry alive and thriving. It will take a while, years perhaps, before Canada’s licensed industry can fully replace it—if it ever does. In fact, at the moment, there’s only one real incentive, fines and arrest notwithstanding, to shut down an illicit dispensary. If you get busted, you forfeit your chance of ever obtaining a license to operate legally. But for dispensary owners simply uninterested in obtaining licenses, there’s little to dissuade them from simply continuing business as usual.